First, lets quickly think about what you would you use a stylus for. Most academics want to use a stylus to develop ideas. Thus, the capacity to capture handwriting (e.g., when taking notes) and to draw lines (e.g., when making conceptual maps) are the most important aspects to look for in a stylus made for students, professors, and everybody else whose main business is conceptual work. In other words, what we need is a stylus optimized for precision. I have written more about whether or not (and when) you should get a stylus, and I encourage you to check out that post in full. The short version, and my conclusion in the current article, is: If you are willing to experiment a little with your workflow, then go ahead an get an Adonit Jot Pro . However, if you are expecting a true pen-and-paper experience, you will have to wait until the next generation of Bluetooth styluses are available. The Adonit Jot family comprises (among others) the Jot Pro ($30, amazon US link), the Jot Flip ($40, amazon US link), and the Jot Touch ($100, amazon US link). All three have in common that they have a ballpoint and transparent disk instead of the rubber nib most styluses have. It is this unique approach what makes the Jot the most precise stylus on the market (more about this below in “What I like”). The Pro and the Flip are basically the same stylus, expect that the Flip has an additional fine-tipped pen (for paper) on the other side of the disk. The Touch does not have a pen for paper, but it has a pressure sensitive tip. That means that the Jot Touch reacts to the amount of pressure you apply to deliver more accurate interpretations of your strokes. I bought the Jot Flip a little more than a month ago. It is my second stylus, and it has fully replaced the rubber-nibbed Griffin stylus I used before. Based on my experience, I can recommend the Jot Pro and the Jot Flip whole-heartedly for academic work. For the Jot Touch, see below. What I like most about the Jot (Pro, Flip, and Touch) is the degree of precision it offers when taking and editing notes. I admit that its design might appear strange at first, but in my mind there is no doubt that the ballpoint and clear disk design is much better for handwriting and making conceptual maps than the rubber nib found in most other styluses. The reason for this is that you can actually see the line you are making right under the tip. The rubber nib of most other styluses hide the line you are making, so that you have to guess half of the time where you are making the dot of the “i” or where the next letter can start. With the Jot, you can see the line and previous letters right under the clear disk, which makes writing a much more natural experience. 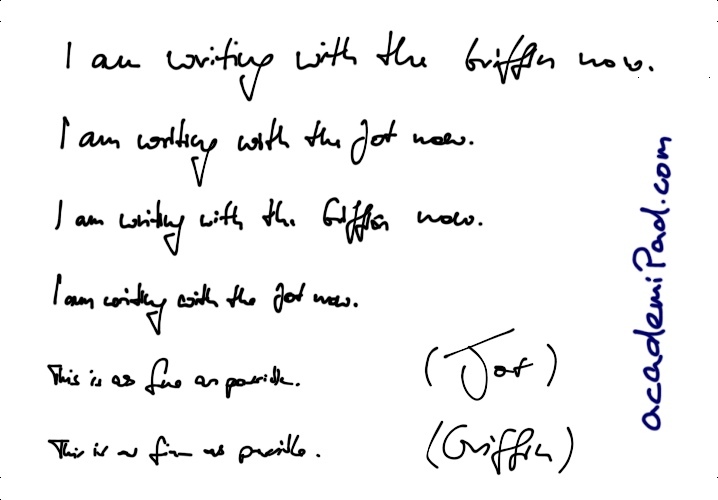 Note that while the Jot tends to produce a more detailed handwriting, the real difference lies in how much easier and more naturally it feels to write with the Jot. I played around a little with both my previous rubber-nibbed Griffin stylus and my Adonit Jot Flip stylus in Penultimate. You can see that I achieved more condensed and slightly clearer handwriting with the Jot (my handwriting isn’t really great to start with, not even on paper). The real difference, however, was in how much easier and natural it was to write with the Jot thanks to seeing the line right under the tip. I was able to write smaller and more condensed letters with the Jot compared to the Griffin stylus (which has a rubber nib). The real difference, however, was in how more natural it felt to write with the Jot. Seeing the “ink” appearing right under the tip much more resembles how we are normally write on paper (although it is still not the same). And it is not only writing, but also editing and drawing that benefit from the Jot’s ballpoint-and-disk system. Many note taking apps (e.g., Penultimate, Notability) have some cut/copy/paste mode which requires you to circle the area you want to copy or cut. With the Jot, you can do this much more precisely (e.g., cutting right between letters). This increased level of precision is also helpful when you are using the rubber, or when you are connecting lines in conceptual maps. Adonit claim that the Jot is the “most precise stylus”. Obviously I didn’t try out all styluses, but after having worked with both a rubber-nibbed stylus (from Griffin) and the Jot Flip, I can say that the Jot really allows for a much higher precision than traditional styluses. For me, this makes the Jot the best stylus for academics, because handwriting and drawing (and connecting) fine lines in conceptual maps are the most important aspects I am looking for in a stylus. By the way, The Verge also thinks that the Jot is the best stylus for handwriting. The second reason why I think that the Jot is the best stylus for academics is its convincing built quality. It simply feels great to hold the Jot. When you are holding a Jot, you immediately notice that this is not a Bic pen. It has the dimensions (length and especially thickness) of a luxury pen, and its high quality aluminium and steel give the stylus a reassuring weight. The Jot is well balanced for writing on the iPad, and the rubber grip further improves grip on the stylus. In comparison, my Griffin stylus is much shorter, thinner, and more toy-like. Beyond precision / accuracy and ergonomics, Adonit also added a protective cap for the precision disk and magnetized the Jot Pro and the Jot Flip. So if you are using an iPad 2 or newer, you can attach the stylus to the long side of the iPad. One thing I am asked about the Jot a lot (look, it rhymes!) is whether it scratches the screen. I stopped worrying about scratching the screen through normal use a long time ago, and I still don’t have any noticable scratches in my first-gen iPad’s screen after using the Jot for over a month without screen protector. Talking about screen protectors, Adonit writes that the Jot does not work well with some screen protectors that increase friction. Among these are the ZAGG Glossy Invisible Shield, Bodyguardz, and other shenanigans. One thing that might happen in the long run is that you have to replace the plastic disk. I haven’t had to do this yet, but it is worth to keep this in mind and maybe order some extra replacement disks ($6 for 2 disks) from Adonit if your are getting a Jot. There is really not much I don’t like about the Jot. With my exemplar, the rubber grip overlaps a little with the metal of the upper part, but that wasn’t a big enough deal for me to complain to Adonit. Also, when you are doing the first stroke, you first have to position the plastic disk on the screen, and that takes a little to get used to. Finding a position that works for you is pretty easy though, as the ballpoint pivots well. My really only problem with the Jot (Pro and Flip) is that the ballpoint tip gives you a little bit of a “hard landing” on the screen. This makes writing with the Jot certainly louder than normal pen and paper or a more traditional rubber-nibbed stylus. Also, this hard landing makes the Jot less ideal for tapping on icons and buttons (i.e., navigating with the stylus). Once you are on the way with writing, however, this hard landing and the noise is a lesser issue. In addition, the new Jot Touch is equipped with a dampening tip which promises to make the landing softer and to reduce the noise of notetaking and sketching. I hope that this feature will make it into future versions of the Pro and Flip as well. I have a few more issues about the Jot Flip and the Jot Touch, which I discuss further below when comparing them to the Jot Pro. The accuracy of the Jot, together with its built quality and ergonomics, by far outweight the hard landing of the ballpoint tip. Seeing what you write the moment the tip touches the screen makes writing on the iPad a much more pleasant experience, and there is no way I am going back to a crayon-like rubber-nibbed stylus. The ballpoint-and-disk design of the Jot allows for much more precision when using a stylus. Unlike most rubber-nibbed styluses, the tip of the Jot resembles a traditional pen. The Jot Flip even comes with a pen on the other side. I am not saying that there are no uses for rubber-nibbed styluses, and a fine-tipped (6mm) rubber nib stylus (such as the Wacom Bamboo ) might be okay if you also want to navigate with it or if you are into drawing. However, if you want to use a stylus primarily for handwriting and drawing conceptual maps, the Jot is the best choice for you in the moment. The question is, which Jot is the right one for you? The Jot Pro and the Jot Flip are identical when it comes to the ballpoint and precision disk side of the stylus, but they differ on the other end. The Jot Flip hides a fine-tipped pen (for paper) on the other side of the disk, which you can reveal by twisting the barrel. I bought the Jot Flip because I thought this was a neat idea. However, I would rather recommend getting the Jot Pro instead. The pen is okay, a little hard for my taste, but okay. The problem, however, is that you don’t have the same ergonomics when using it, because the stylus is balanced to use the ballpoint and disk end of it. Furthermore, the rubber grip is only for the digital stylus as well, not for the paper pen. What I am saying here is that the paper pen is a little awkward to hold. In addition, I sometimes accidentally twist the barrel a little while writing with the stylus, so that the pen emerges. Not a big deal, but altoghether, I rather use a dedicated paper pen next to a Jot Pro. My recommendation: Go with the Jot Pro. It saves you ten bucks, and you have more colors to choose from. The Jot Touch is a Bluetooth enabled stylus that looked very promising at first. Besides the dampening tip discussed above, it also adds pressure sensitivity to the mix. Together, these two features promise to make notetaking on the iPad an even more natural experience. However, the Jot Touch does not support palm rejection, which would be required for a really immersive pen-and-paper experience. As I have discussed in another post, the current Jot Touch is based on Bluetooth 2 technology, and we have to wait for the next generation of Bluetooth 4 styluses to get palm rejection. My recommendation: Unless pressure sensitivity is really important for your (e.g., you are an artist or design student), I would save some money and go with the much cheaper Jot Pro. Wait until the second generation Jot Touch with palm rejection comes out. This will be the right time to drop some serious cash on a stylus, because a dampening tip, pressure sensitivity, and palm rejection will make writing on the iPad almost as natural as writing on your good old moleskin notebook. Based on my personal experience with the Jot Flip, I can whole-heartedly recommend getting a Jot for capturing your handwriting and creating conceptual maps. In my opinion, the Jot is the currently best stylus for academics out there due to its precision and overall feel. The Jot Pro offers you the best bang for the buck in the Jot family, and I would hold off buying a Blutooth stylus until they support palm rejection. If this review was helpful in your decision to get a Jot, and if you want to support academiPad, please be so kind to use the links provided in this review when buying a Jot. These are affiliate links (fair and unbiased – see academiPad’s affiliate link policy). Using these links helps me to write for academiPad, and they won’t cost you anything extra. Thanks! Disclaimer: Writing sample by academiPad. All other images by Adonit. This review is based on using a Jot Flip for over a month. All product links are affiliate links. Please consider sharing this article if you found it useful. Have you tested the new touch? I have a 4th gen iPad and was wondering if it is worth the money. They seem to have dropped the price over the original. Yeah, the price is down by $10. I haven’t tested it yet, though. I don’t even think it is out yet. The adonit webpage says “Preorder” as of today. Once I upgrade to the next iPad (don’t have BT 4 right now) I will get this stylus. I am very happy with the Flip, and the 2nd gen Touch with its dampening tip and palm rejection alleviates my only two grievances with the Jot I had. Looking forward to this! Not sure if I have missed out any piece of information from your review (which is very detailed & helpful, thank you so much!) and so this may come off a stupid question lol but does the Jot Pro support palm rejection? Thanks for the clarification Jo! However, I haven’t considered the chance of scratching my screen. Truthfully, I would be surprised to see a problem with Gorilla glass. Any idea when the NEW Jot Touch WITH support palm rejection coming? Your reviews are in general informative (thank you! ), but this seems highly biased. You have ignored the two main complaints of many users, that it has a high probability of scratching the screen and that it you need to treat it like a Ming vase, by saying you dont worry about it. There are pictures of scratched screens in the links you have on the site. I havent heard of this too much with old-fashioned rubber tips. Hi Rapo, thanks for the praise about academiPad. About this post: It is based on my personal experience with the Jot for over a month, and I have no complaints. Adonit has an extensive support threat on its page about the Jot scratching the screen (http://support.adonit.net/entries/20865032-who-is-going-to-pay-for-my-screen). As they explain there, it is possible that debris caught between the disk and the screen causes scratches. For this reason, they suggest to use a screen protector, or if you don’t want this, to keep screen and disk as clean as possible. “…as we have already explained, it is not our product that is scratching screens; it is environmental debris. You can see this for yourself by looking at the underside of a Jot disc under high magnification. Scratches on the bottom of the disc indicate that particles between the screen and disc have scratched both screen and disc. I have provided an example in this thread. Like other stylus manufacturers, we have a notice on our website advising that if customers are not going to use a screen protector on their device, they need to keep their screen clean. See, I don’t like screen protectors, thats why I am not using one. I gladly take the risk of scratches over dust trapped under the protector and the plastic feel of the extra film. Thats why I am keeping my screen clean. You can disagree with me and take a screen protector that works with the Jot (see their webpage which don’t work), and you will be fine. It is also worth pointing out that not all scratches are really impairing your user experience. As you see in the post, and I should have made this maybe more clear, I write that I don’t have any “noticeable scratches” in my screen. If you turn the iPad off, wipe it clean, and hold it in a certain angle into the light, you will see very fine scratches on my iPad’s screen. However, if you face it directly, or if you switch it on, you cannot notice these scratches any longer. Thats how fine they are. I understand that some people are very concerned about their gadgets, especially when they are just new. I was too with my iPad for the first few days after unboxing it, but I loosened up. For me its a work device, and as long as I don’t notice scratches when it is lit up, I am happy. And I don’t see any. In return, I get a better user experience (better touch, more precise stylus), and this is worth it for me. I hope this makes things more clear. I tested the Jot extensively and give a detailed review of its capabilities and shortcomings (especially the Flip and Touch) – in much greater depth than you will find in most reports on the web. From my experience, the chance of scratches is not a shortcoming of the Jot. As I said, I don’t have any noticeable scratches (i.e., scratches you can see when using the iPad), and this is what counts. I would by an Adonit Jot Pro again (and a Touch when it adds palm rejection), and this is why I recommend it. I wouldn’t do otherwise. Please feel free to get back to me if you have additional questions or concerns. Have you checked your screen lately? I just bought an iPad and tested Jot and caused scratches. I thought you know better than quoting Jon, the company dude, than the rest of the Jot user who complained.